Infinite State Games at TIGA 2012 – capers ahoy! 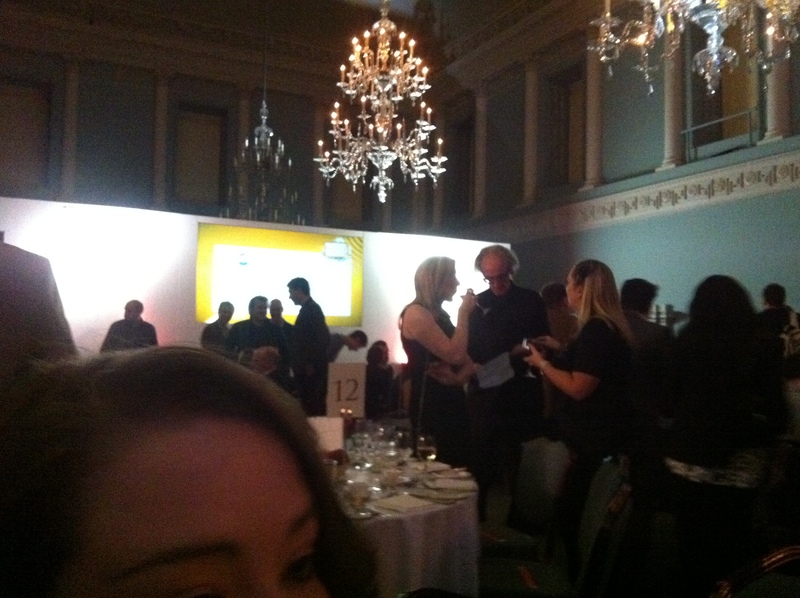 So, we had a great time at the TIGA 2012 awards. We didn’t win anything, but then we only entered two categories. It was absolutely hilarious seeing our game on the big screen along side all those other whopping titles, a memory which we’ll never forget. It was a fantastic evening and we met loads of awesome, awesome people. The Stick Sports Ltd. team were ace, we got to chat to Gary Penn from Denki about TV detectives, and nice man from Edge magazine said he’d heard of our game! Hooray! We know what you’re all wanting to know though… what was the food like? Starter was celeriac with a pear and bits of blue cheese. It was quite nice. Main was chicken with some potato. Lovely chicken, nice gravy. Charlie was particularly happy with the gravy. Pudding was a really nice apple pie with a bit of ice cream, which is just what Barry fancied so he was happy too. So even though we didn’t win, it was fun. We managed to flood the twitter feed at one point by orchestrating all our friends to simultaneously tweet about Frutorious. We also liberally scattered some fliers about encouraging game journos to support our tiny team and silly game. A few of them found their way onto the front of Future publishing but we have only the wine to blame for that. Next stop – losing the BAFTAS! 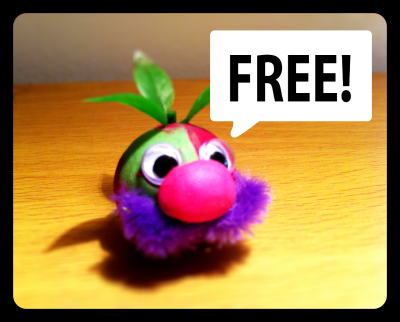 Frutorious FREE till 5th November to celebrate TIGA 2012 awards! FRUTORIOUS FREE FOR A BIT! So all that’s left to do now is sit and wait to find out the answer to the question on everyone’s lips… What food they doin’ at the meal? Charlie will be hungry after the long drive and I know what he’s like – he’ll want a bit of gravy. Personally, I’m in the mood for a bit of ice cream! So yeah! Please go share this, tell your palz and family, tell all your internet-chums and that woman you say hello to with the dog. Impress hipster friends by introducing them to it, believe me, they wouldn’t have heard of it! We’ve made our third and final pre-launch video. Three videos, eh! That’s a lot of videos isn’t it?! Well it’s more than usual, but then this is an unusual game. We realised that it needed that little extra push to get into people’s hearts and minds that one prod wouldn’t do, what we needed was an opening pre-launch triumvirate salvo of three very different videos. Let’s talk about our three pronged trailer attack – our ‘Shonk and Awe’ publicity plan! 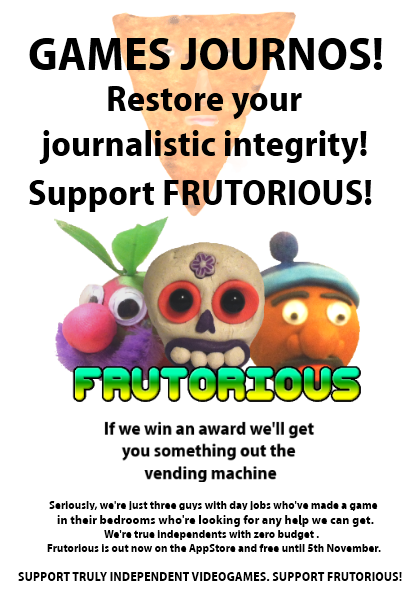 How do you solve a problem like Frutorious? Firstly, the game has a light-hearted feel to it and a quirky vibe which is hard to describe in words, especially when you’re so involved in the game. That’s why we felt the best introduction to the game would be our first trailer ‘The Making Of: Frutorious.’ We wanted to get across the fact that we’re a focussed, passionate team who at the same time aren’t taking ourselves very seriously. We also wanted to approach the ‘making of’ documentary structure with a much more playful style. Secondly; the mix of felt, plasticine and hand drawn art is something we’re very very proud of, so we definitely want to show it off as much as possible! That’s why our second trailer ‘Frutorious: Story Trailer’ focussed on the hand-drawn elements and set up the back-story for the game. Thirdly, the concept of a sling-shot platform game with fruit, arcade elements, pinball, golf and 90’s Hip-Hop puns doesn’t translate well without just showing video of it being played. The more video of people actually playing the game we can get out, the easier it is for people to understand what the game is about, which brings us here today with the third video ‘Frutorious: Gameplay Trailer’. As well as showing people what the game is like to play, it also showcases the sort of variety in visuals and gameplay that we’ve got going on. We hope it gets about and people see it! With the release of Frutorious about a month away, we’re busy beavering away at it, fixing bugs, slickening up things and generally polishing knobs. Here’s a video of us playing three levels from the beta build of the game we thought you might enjoy seeing! It’s a fascinating, and at times harrowing glimpse into the work that goes into making an iPhone game.